You will be given a reference e-book to read which has 193 pages And the test will be based on that e-book , you can take the test only after 10 days Of &nbsp;purchase. Project management accounting can be defined as an accounting process which focuses more on both business management and money management. The whole process is more focused on managing the accounting side of any organization whether it is for the purpose of creating budgets by working with other organization or implementing accounting practices in a regular business. If you want to earn a project management accounting certification, then it is important for you to improve your skills in handling money, maintaining the cash flow of an organization and understanding the amount necessary to successfully carry out various business projects. Certain ethical traits are also needed in project management accounting and these include honesty, due care, objectivity and integrity. Project management accounting works in providing organizations essential data needed in their successful operations. The entire process involves the preparation of different reports that focus on showing the actual performance of business units and managers in comparison to the established plans. Project management accounting is also defined as a process which enables accounting firms to prospectively manage all their engagements with the help of time sheets. Deciding to get your project management accounting certification from Brainmeasures is one of the wisest moves that you can ever take. The reason behind this is that this company is ISO certified and is popular for being one of the leaders in providing online certification to anyone who wish to enroll in their many programs. All the programs in Brainmeasures including its project management accounting course are also developed by experts so you have a guarantee that you will be getting the best learning experience. Just make sure that you are serious in completing the course so you will get your skill certificate as soon as you pass the project management accounting test with flying colors. It should also be noted that the online exam for those who are part of the project management accounting certification program of Brainmeasures is created by real experts in the field so passing it is an indication that you will also become an expert in your chosen career. 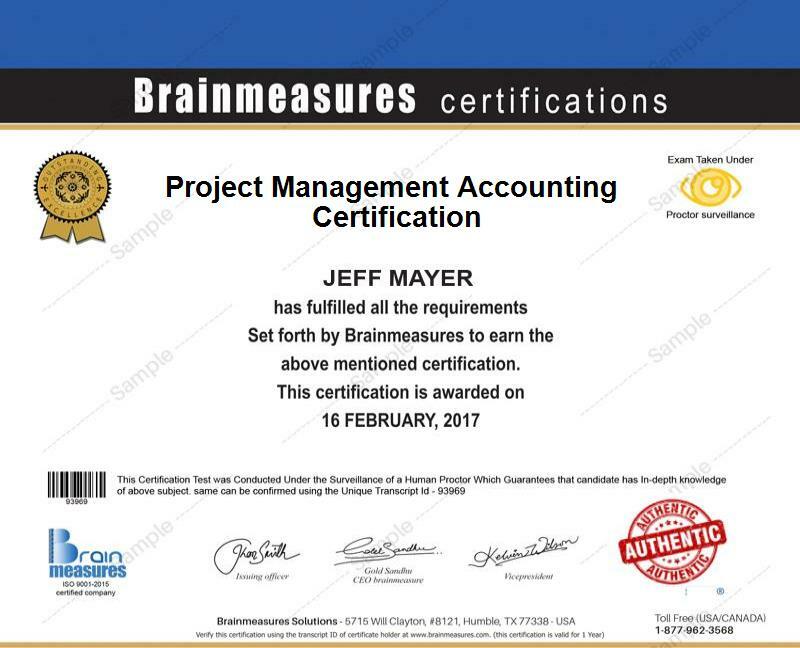 Aside from the topics mentioned above, the project management accounting certification program offered by Brainmeasures is capable of providing more information about how you can successfully handle a project and effectively control its budget and any other factor that may affect its financial performance. The program does not only consist of the project management accounting course itself but also the project management certification exam which when you pass will let you take a hold of your hard copy certificate in project management accounting. Note: You can get a clearer view of the syllabus of the program after you register an account with Brainmeasures and log into it. Anyone who has a strong desire to become a project management accounting expert can enroll in the Brainmeasures’ project management accounting certification program. No qualifications or requirements are needed to become part of the program. The project management accounting certification program, however, is highly recommended for people who are running project-driven companies such as government contractors. It is also perfect for those who are operating construction companies and offering professional services to the public as the knowledge that they can get from this course can help them meet the demands of customers and certain project management, regulatory and accounting requirements that remain unsupported by traditional business management and accounting software. Just like any other programs offered by Brainmeasures, the project management accounting certification program offered by the company also allows you to enjoy a wide array of career opportunities. You can apply for the following positions as long as you complete your project management accounting certification course. Enrolling in a project management accounting certification program and getting your certificate after completing it can demonstrate your strong commitment to the career and you can expect this to result to not only an improved job satisfaction and an increased number of job opportunities but also higher earnings. As a project management accounting certification holder, your earnings can be expected to reach up to $48,000 per year if you are still new in the industry and up to $236,000 if you get the highest rank in the industry which is the Chief Financial Officer.